Photo by Ryan Hyde on Flickr and used here with Creative Commons licensing. The following featured speech by Florida International University’s Allan Richards was presented at the Breakfast for Editing Champions session at the AEJMC 2015 national conference in San Francisco in August. The speech spoke to the great need for balancing the teaching of digital skills with language and writing skills. I want to thank Andy Bechtel for inviting me to speak at this year’s AEJMC Breakfast of Editing Champions. I also want to thank our sponsors the Dow Jones News Fund, the American Copy Editors Society, Poynter’s News University and the Newspaper and Online News Division of AEJMC for their support. I am someone who usually writes and speaks in grammatically clean English and challenges students to do the same — but I’ve never spoken before a group of editing champions. So if I get a little tongue-tied and start perverting the language – saying things like farther instead of further – it’s because I am anxious and not just eager to please. Andy asked me to talk about what we’ve been doing at FIU to improve students’ language and writing skills. But before I get into that I want to talk about why I have titled my remarks Writing-First in the Digital-First. I believe that solid writing must reign as the most important skill for those working in the media and communications industries today, especially amid the digital revolution — just as it did in the pre-Internet era. Writing is still fundamental. 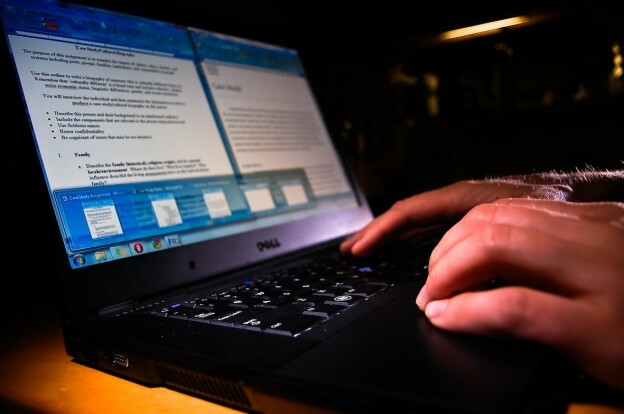 There are two powerful forces working independently and simultaneously that are having a hugely deleterious effect on student writing skills, creating an even more urgent need for focus on writing in the JMC curriculum. One is the dynamic shift in U.S. demographics. The U.S. Census estimates by 2022 26 percent of all teenagers and 23 percent of those between 18 and 34 will be Hispanic. I teach in a school that is 72 percent Hispanic, with many first-generation students who are new to English grammar and primarily speak Spanish at home. So I understand the challenges of students raised in a home where English isn’t a primary language. I also have some personal experience being raised in a home with a Russian grandfather and an Austrian grandmother who mostly spoke Yiddish to each other and also communicated with a lot of emotional hand-waving. I actually thought the word vitamins was witamins, as my grandmother used to say. And on more than one occasion, my grandfather brought me a birthday cake that said Ellen instead of Allan because he couldn’t enunciate well or read in English. The point is that there are many smart, capable students in our schools who want to go into the communication field – be it journalism, public relations, advertising or some form of digital media – but can’t write grammatically correct declarative sentences or express themselves well in English. I have colleagues across the country who teach in schools with a large percentage of Asian students. They report having similar experiences as those of us who teach in Hispanic-serving institutions. The second phenomenon is the digital revolution. 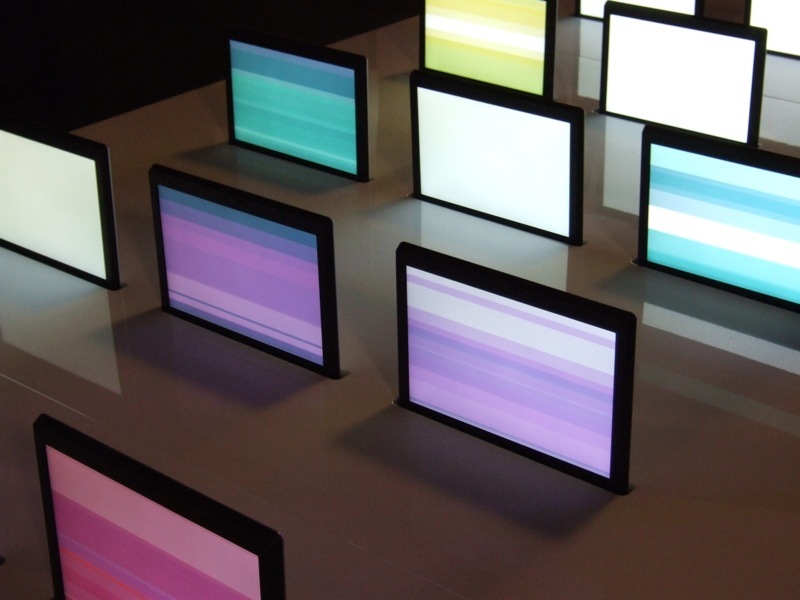 We are now several decades into an era that requires new technical skills and multitasking on a variety of platforms and also places a growing emphasis on visual mediums. Many of these more technical skills distract students from the fundamental skill of writing. Before anyone thinks I am a cranky, die-hard traditionalist, I started our school’s digital journalism program and developed our first web newsmagazine more than a decade ago. I also led the development of our digital curriculum, including our Digital Media major – all while concocting our language skills/writing program. In recent years, we have increasingly heard the same refrain from editors, public relations directors and recruiters demanding that students possess a variety of digital skills. Our school is housed in a three-story concrete block of a building, with a catwalk that wraps around each floor, on Biscayne Bay in North Miami. One of the non-academic challenges of teaching in Miami is the late spring/early summer storms. Storms generally rumble in from the Everglades late in the afternoon with window rattling thunder and terrifying bolts of lightning that rip across the sky. My office is on the third floor, and when I look westward and see the carpet of black clouds, I know it’s just a matter of minutes before the rain floods our parking lot to the middle of our hubcaps. One afternoon, while walking along the catwalk, I saw dark clouds moving rapidly toward our campus. I dashed down the steps two by two hoping to make it to my car before it started to rain, but I was too late. The sky broke – it was pouring when I reached the landing. I was about to race to my car when I was stopped by the sight of two students dancing arm and arm around a tree, singing something about a grammar test. As I sloshed past them, they were completely drenched but gleefully singing — “I passed the grammar test, I passed the grammar test!” over and over. Yes, the students were referring to our Language Skills Test — or The Dreaded Grammar Test as they call it — which they must pass to take our gatekeeper course and enter their major. As the creator of our current program, I have seen students drop to their knees and thank “Senor” above for passing grades. I have seen the stream of tears of those who failed the test. But I had never seen such an exuberant outpouring of joy, relief and wild dancing in a nasty South Florida afternoon storm. We developed our current language skills and writing program over the past nine years. We have since experimented – had a number of stops and starts – some trials and errors – and have done a lot of fine tuning in an effort to teach our particular student body the importance of language and good writing. So, here’s what we do and here’s how it works, and a few lessons learned along the way. We have a two-part Language Skills Test that all students must pass to gain admission to our gatekeeper writing course. The test includes a computerized, self-scoring, 100-question multiple-choice exam and a writing assignment. The questions were written by our faculty and are drawn from a large database comprised of multiple question banks. The test questions are randomly selected by the computer so no two students have the same test. Our current passing score for the multiple-choice part is 70. The writing sample is used to diagnose whether students can write grammatically correct declarative sentences. If you are interested in reading about the evolution of the test, you can read about it in my article “How a Dreaded Grammar Test Became a Pioneering Model for Bilingual Students,” published by MediaShift. To help students prepare for the exam, we also created a digital practice site with self-scoring practice quizzes focused on various categories we believe are essential and fundamental to good writing, including subject-verb agreement, verb types, sentence types, phrases and clauses, etc. Rather than having to read dry grammar rules and explanations, I thought it would be more palatable – possibly even fun – if the quiz answers were light-hearted, offbeat, something that might ease the pain or tedium of studying grammar. In teaching, I often compare learning grammar to learning a musical instrument. 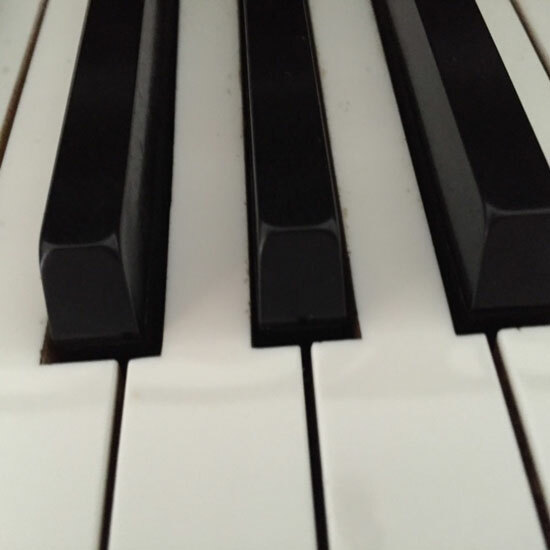 Anyone who has ever played a piano, or bowed a violin or blown into a saxophone, knows that they had to first master scales and play in time – whole, half, quarter, eighth notes, etc. – before they could play Chopin, Mozart or Charley Parker. Learning to play an instrument requires patience and enormous repetition. Music and grammar are similar in that sense. Music being a language of organized sounds and tones; writing being organized thoughts and words. How many of you sing in the shower? Most people have no idea what they sound like, but enjoy the pleasure of singing. Those of us who have to listen to them will agree that they more often than not sound like howling coyotes. But even those warblers who massacre melodies can – through training, practice and repetition – improve their sense of pitch and be taught to organize a group of notes into a pleasing melody. The same is true of writing. These skills can be learned. In one recent year, 1,600 of our journalism, public relations and advertising students accessed our digital language skills practice site for more than 90,000 hours. That is more than 200 self-tutoring hours per student per month – in preparation for the Language Skills Test. In addition to the practice site, we hold what we call Grammar Slammers twice a semester. These are three-hour tutorials. Three of our full-time faculty, including myself, teach the Grammar Slammers to help students prepare for the Language Skills Test. We also offer a three-credit course called Grammar Workshop, which is taught on-ground and online, for students who feel they need a refresher course in language skills, or who are still struggling with English as a second language. In addition to the online practice site, the Grammar Slammer and the Grammar Workshop, we also have a Writing Center where students receive tutoring in writing. When I started building our language/writing program, I always knew that our students would need more than a grammar test or a grammar practice site. Our friends at the Scripps Howard Foundation agreed and awarded us funds to develop this Writing Center. So is what we are doing working? We have considerable feedback from our faculty about improvements in student writing. For example, my own experience is similar to that of other faculty members. I remember when I taught my first class as an adjunct in 1997 and sat down to grade my first batch of student writing. Have you ever tried to unravel a ball of yarn after your cat got hold of it? I spent an hour on that first paper. I knew we had to find a way to improve student writing. Today, I am happy to report that faculty are unraveling far fewer balls of tangled writing. Another indicator of our success are the calls I receive from our grads who get back in touch with us – thanking us – for spending so much time and energy on their language and writing skills. We hear it over and over again – the program sharpened their writing and prepared them to compete in very competitive markets. 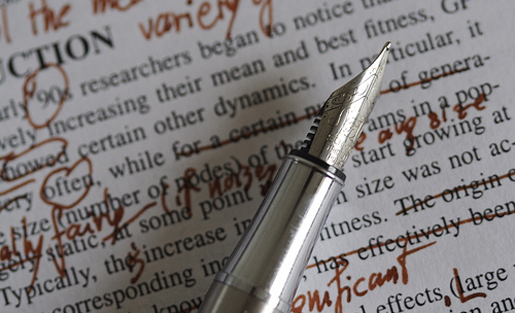 Many comment that they serve as the grammar police in their offices correcting their CEOs and colleagues. Our students are making their marks at such organizations as the NY Times; NPR; CNN; BBD&O. Jessica, Avigail and Silvana were all in my journalism classes and are excellent examples of students who benefited from our writing program. Apart from student responses, we get plenty of industry feedback, including from members of our School’s Advisory Board – which includes the executive editors of The Miami Herald and Sun-Sentinel and the CEO of the Scripps Howard Foundation – who praise our student writers and thank us for our commitment to teaching writing as well as digital skills. Additionally, we have hard data that show improvements in our students’ language skills. For the past nine years, we have collected and analyzed test results that indicate significant improvements in language and writing proficiency. An average of 50 percent of the students who use our digital practice site and attend the Grammar Slammers pass the Language Skills Test. Also, the percentages are over 10 percent higher for students who take the three-credit Grammar Workshop before taking the test, ranging up to as high as 66 percent. By the way, these data have been used as a primary direct measure for Standard Nine – the Assessment section — of the ACEJMC self-study. Our School was lauded by the ACEJMC Council in our recent reaccreditation. This is the third accreditation in a row in which we have been recognized for our emphasis on testing and teaching language skills and writing. 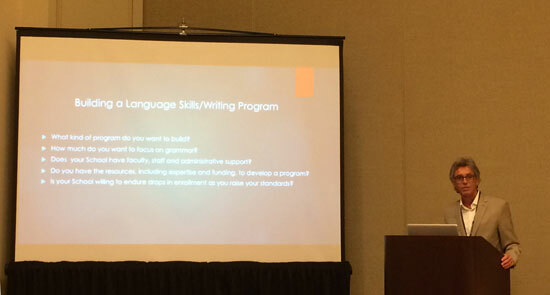 I often get calls from JMC administrators and faculty interested in learning more about how we do what we do and how our experiences might be useful to them in building a language skills/writing program. First, what kind of program do you want to build? Do you want to test and teach students grammar or focus more on writing skills? What changes in your curriculum will be required? If you are going to develop a program, does your school have faculty, staff and administrative support? I would also include IT support. IT played a critical role in developing and securing our system. We have had a few technical bumps as we changed platforms from Blackboard to Moodle and back to Blackboard, but we have never had one instance of anyone compromising our question banks. Does your School have the resources, including the expertise and funding, to develop a program? If not, where can you find the expertise and funding? Finally, before you raise your entrance standards, in the age of retention and graduation metrics, is your School willing to endure a temporary drop in enrollment? These are just a few questions that might spark conversations at your School. In closing, I can’t promise you that if you place more emphasis on teaching language and writing skills your students will be dancing in the rain. But I can guarantee that they will be calling to thank you for making Writing-First in the Digital-First age. Allan Richards is associate dean and associate professor at Florida International University’s School of Journalism and Mass Communication (SJMC). He oversees SJMC’s language skills program. Richards developed the SJMC’s current computerized language skills testing program with a grant from the Ethics and Excellence in Journalism Foundation and the SJMC’s Writing Center with a grant from the Scripps Howard Foundation. Richards began his career as a music journalist in New York. Truer words were never spoken. Very well articulated. In light of this trend, I’m curious to know if this trend might catalyze increased demand for specialty/creative/in-depth writers? If so, what potential employment opportunities could materialize for professional writers in mass media, journalism in general or niche/boutique online industries?